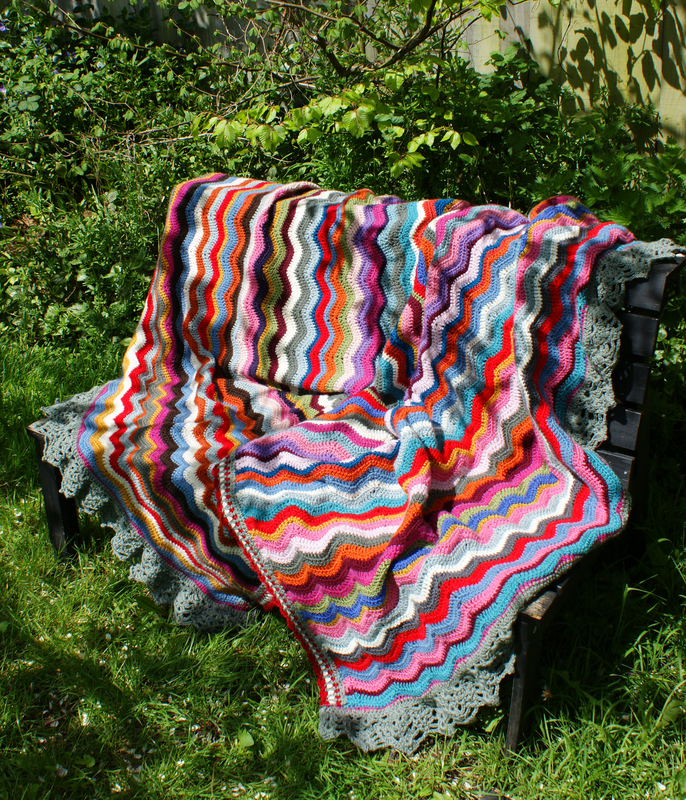 Ripple One – my first ripple blanket is finished! And – the sun came out to celebrate! 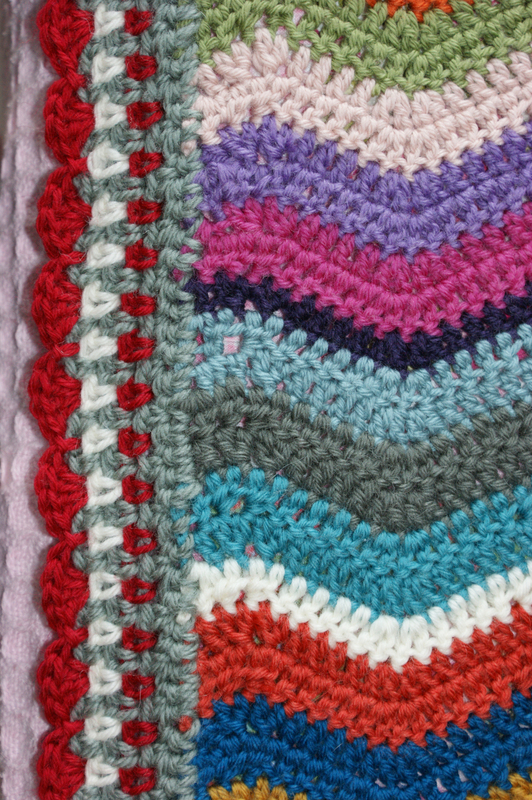 I hooked away at the foundation chain and first row, whilst watching Wales win the Six Nations Triple Crown (its rugby, if you’re not Welsh), on 25 February and I finished it last evening 10 May. That’s 75 days by my counting. 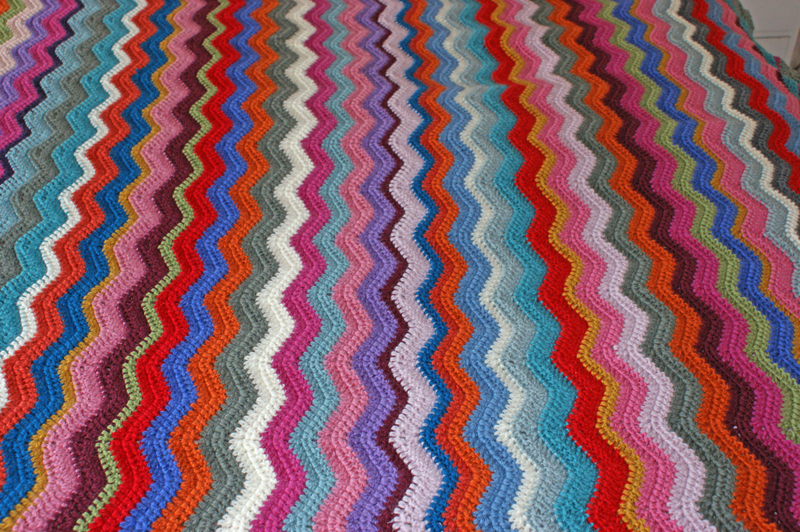 155 single rows (most stripes are 2 rows of the same colour) and she weighs 1.6 kg. She’s 1.55 m from below the pillows to the bottom of the bed and 2.10 m wide, including the pineapple border. I haven’t crocheted pineapples for at least 30 years – they’re fun! Now I mentioned this morning that she’d challenged my perceptions. Almost every day for months, I’ve measured progress by holding her up against me, with the stripes horizontally placed. 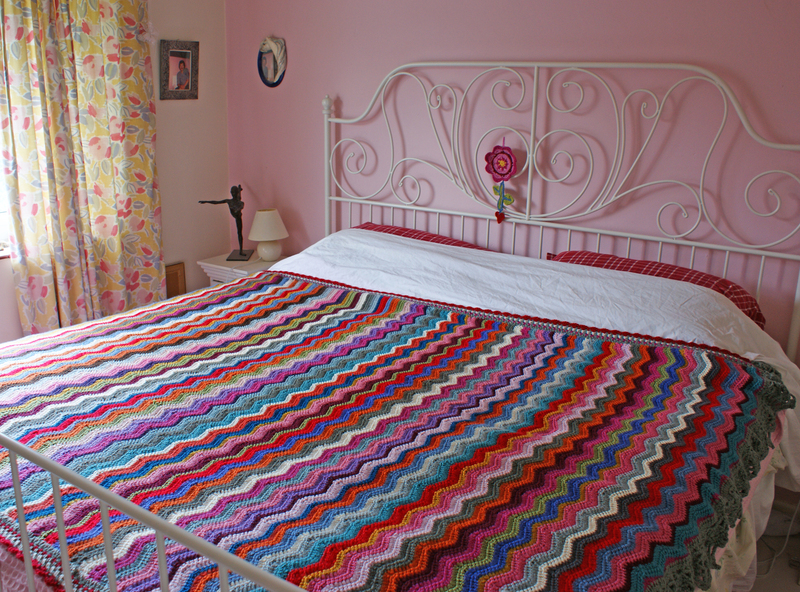 Then, as I made more progress, I laid her on our bed – my beloved, who has become very attached to this blanket, kept asking if it was going to fit on the bed – but with the stripes placed horizontally she wasn’t wide enough to keep both of us warm. 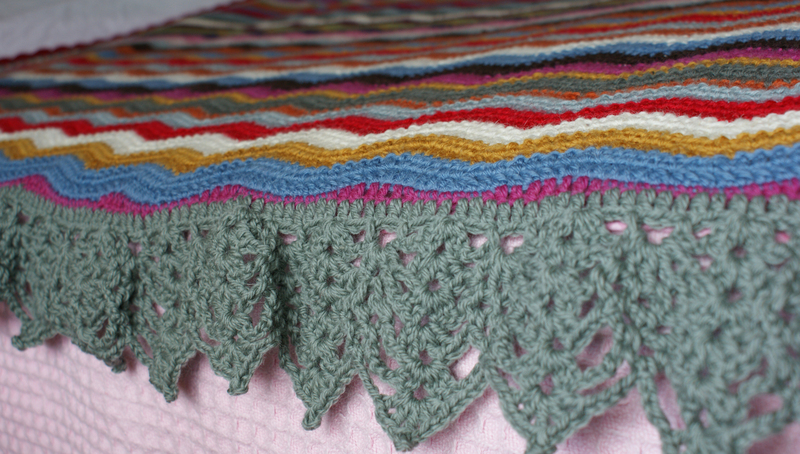 I pondered and fussed for weeks – whilst still increasing the rows! The solution was staring me in the face – as most do, if you wait for a while – turn her sideways! I added a few rows and a simple red shell border to the top and bottom borders but wanted something just a bit showy for the sides. So when a rummage in a local charity shop revealed a huge bag of beautiful Robin pure wool, in a non-challenging grey, my mind was made up – pineapples all the way! It took me a few attempts to reconcile myself to stripes going sideways, but all is well in ripple-land now. I’m so pleased with her. Last night we slept soundly, and this morning, when I woke I put my hand outside to feel her – such a sense of achievement. It’s great to make something, to enjoy the journey and snuggle up in the result. Tomorrow I’ll be in Alton – in sunshine hopefully – at the Art & Craft market. Pop by and say Hello. PS Read about her Easter journey here, although she appears in other posts too. § 16 Responses to RIPPLE ONE – DONE! Your blanket looks great! It looks like it took forever to make, and I love the border! It adds such a nice finish. You make me want to add a border to mine now, it looks so great! Good job! So pretty, it really does have a lot of movement. I cannot imagine making something so large and so perfect! 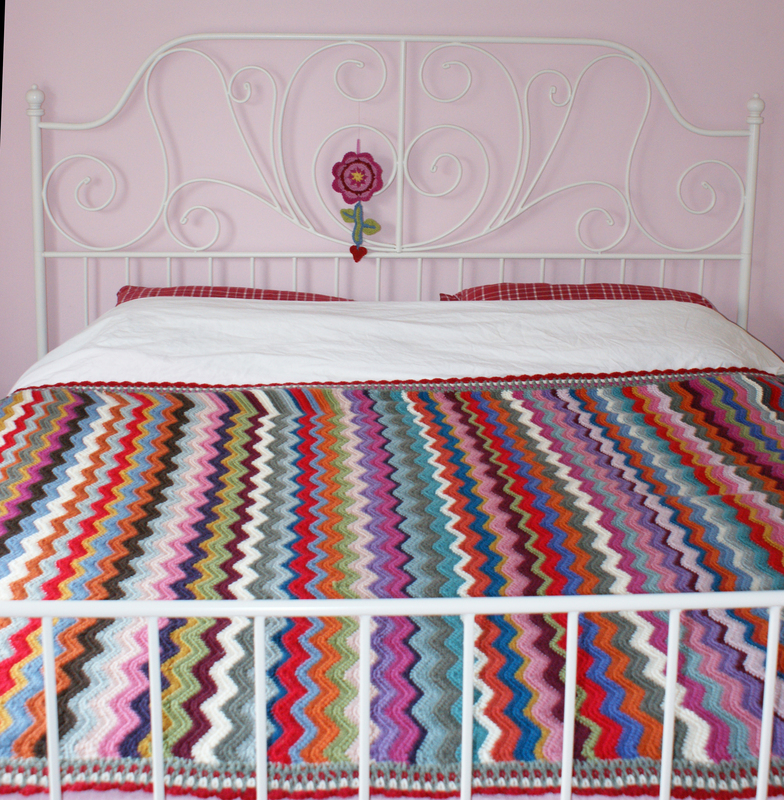 My sort of colours, it looks great on your bed. It did! Thought of you today – we were in Lyme Regis & I had a quick look in a couple of your favourite shops! Belle the collie also recommends the Ripple blanket – sleeping on top of it tho – not under it! 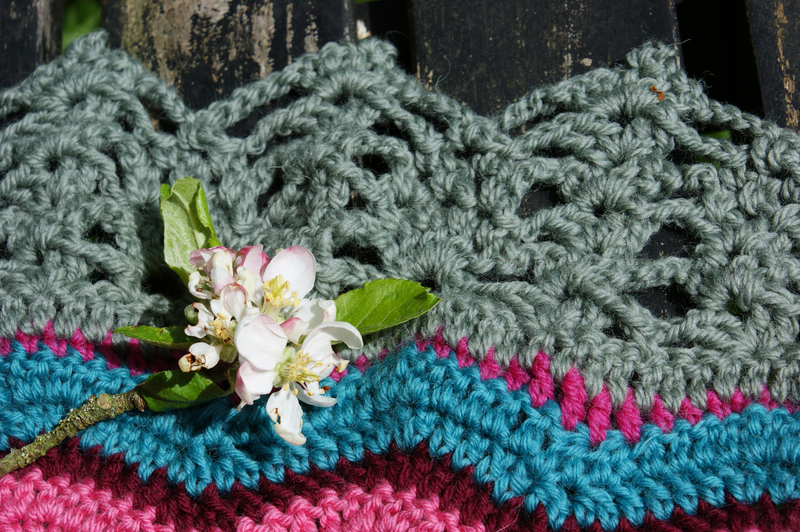 Just can’t believe this weather – sewing today midst battering winds. At least the house is tidy & clean tho! Thank you for popping by – I’m busy making cushions today so expect to see Flora-the-duck, little homes & retro caravans captured on big, comfy, feather cushions, very soon! You are currently reading RIPPLE ONE – DONE! at Adaliza.